About 785,000 people have an initial heart attack and another 470,000 people have a recurrent heart attack every year in the United States, according to the American Heart Association. This means that an American has a heart attack every 34 seconds and one dies from heart disease every minute. A new imaging technique may help identify who is at high risk. The primary cause of heart attacks is clogged arteries. Arteries are blood vessels that carry oxygen-rich blood throughout the body. Blood flows easily in healthy arteries with smooth walls, but blood flow is reduced or blocked completely in clogged arteries when a substance called plaque builds up on the inner walls of the arteries. Artery-clogging plaque is made up of fat, calcium, cholesterol and other substances found in the blood. Over time, this plaque can harden and rupture. If it breaks apart, a blood clot can form on its surface and completely block the artery, preventing blood from reaching the heart muscle and causing a heart attack. If the blood flow isn’t quickly restored, the portion of the heart fed by the artery begins to die. Coronary angiography is the “gold standard” way to identify these plaque blockages in the heart, but it’s an invasive surgical procedure. During a coronary angiography, a thin flexible tube called a catheter is put into a blood vessel in your arm, groin or neck and threaded into your coronary arteries. Then a special dye is released through the tube, making your coronary arteries visible on X-rays pictures taken as the dye flows through them. New study results, recently published in The Lancet medical journal, show that these high-risk plaque blockages can also be identified using a non-invasive imaging technique. The study was carried out by Dr. Nik Joshi and his research team from the University of Edinburgh, the Royal Infirmary of Edinburgh and the University of Cambridge. The study involved 40 people who had recently suffered a heart attack and 40 additional people who had stable chest pain (angina). The patients were given a standard coronary angiography and a non-invasive imaging PET-CT scan. A PET-CT scan measures metabolic activity using positron emission tomography (PET) and anatomical structure using X-ray computed tomography (CT). A trace amount of radioactive drug is injected into the patient’s vein and used to produce 3D images. Joshi and his research team used a radioactive drug called sodium fluoride (NaF). The study aimed to show how well a PET-CT scan using sodium fluoride detected plaques that had already ruptured or were at high risk of rupturing. The coronary angiography was used as a gold standard to identify the culprit plaque deposits that blocked the arteries. The researchers measured the sodium fluoride distribution to determine if the artery-clogging plaques took up a significant amount of the drug. 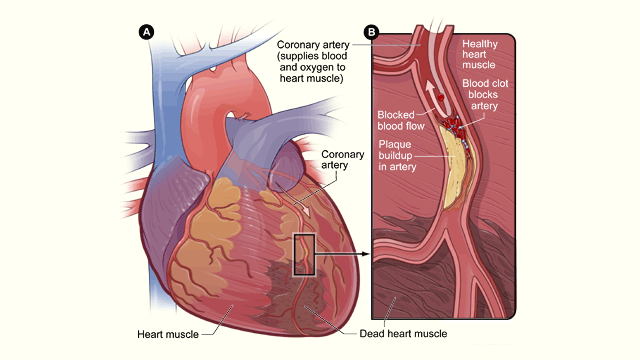 In 93% (37/40) of the people who had had a heart attack, significant sodium fluoride uptake was seen in the plaque responsible for the heart attack. The average drug uptake in these culprit plaque deposits was 34% higher than anywhere else in the heart. In 45% (18/40) of the people with stable chest pain, culprit plaque deposits also took up significant amounts of the sodium fluoride drug. For both sets of patients, the culprit plaque deposits identified by PET-CT imaging were confirmed by histology or intravascular ultrasound to have high-risk characteristics such as calcification and a dead tissue core. Further research studies with a broad range of patients are now needed before PET-CT sodium fluoride imaging is accepted as a standard clinical technique. These studies are likely to take several years to complete. If they confirm the initial promising results, the technique could then move immediately into clinics since it is already approved and commonly used for other applications.